There’s not a better color combo than Red, White and Blue! 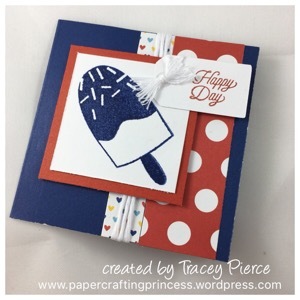 This popcicle from the Sugar Rush scrapbooking set paired with Short and Sweet made the perfect pair for a little Independence Day 3×3 greeting. Thanks for stopping by! Have a happy and safe 4th of July!! Great design papers for your red, white and blue. Fun and happy card. Love this! Check my blog for a bunch of Red, White, Blue challenges you could enter.